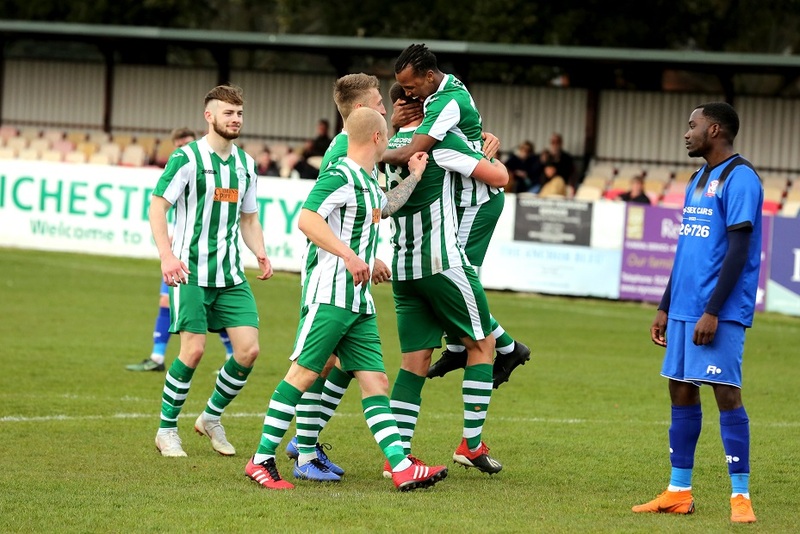 Chichester City are celebrating their first county league title in 15 years – with nearly a month of the season still to play. The Oaklands Park outfit have been in imperious form all season and sealed the SCFL Premier crown with a 2-0 victory over Langney Wanderers last weekend. A first half strike from leading scorer Scott Jones – his 20th in the league so far this season – gave City a well-deserved lead against the Eastbourne side. Then, after a nervy second 45 minutes which saw Josh Clack miss a penalty, Emmett Dunn netted a firm header late on to seal all three points for Miles Rutherford’s side. Even with nearest challengers Horsham YMCA and Newhaven both winning, City have an insurmountable 12 point lead at the top with just three games to go. So when the final whistle went, the Green and White Army went into celebration mode with champagne corks being popped between chants of “We Are The Champions”. It is Chi’s first county league title since 2003/4 and only their sixth since the league was founded in 1920. However, unlike in previous seasons, this year’s victory will be extra special as it means Chi will gain promotion from step five for the first time in their history. It is just reward for Rutherford and his management team who have put together a strong squad in recent years. In previous campaigns Chi were unable to keep their fine winter form going right to the end of the season. But a front line of Jones, Clack, Kaleem Haitham and Gicu Iordache have fired City to success with the club netting 96 goals so far this season – an average of nearly three a match. Chi have also been strong at the back, too, with a defence lead by captain Connor Cody conceding just 28 goals, which is by far the best record in the division. Chi now have a welcome week off, which will allow the players to rest up ahead of an Easter double header. First there’s a trip to Arundel on Saturday April 20 (3pm) before Easter Monday sees City welcome near neighbours Pagham to Oaklands Park (11am). They end the season with a trip to Eastbourne Town on April 27.